The third in the trilogy of Asher's new-age compilation albums, Stardance is entirely instrumental and orchestrated, and tends to use synthesiser sounds and keyboards in a rich inter-woven production technique, rather than 'live' musicians as on many of his other albums. This means that Stardance is predominantly electronic rather than acoustic, and yet the melodies and instrumentation remain highly emotive and, on occasion, transcendent. There is an exotic blend of colour in the music... Arabian, Mexican, reggae, native American, Celtic and Italianate tunes, with a pop/folk lilt, and yet at times a prayerful attitude. Listen out for the epic 'Wings of fire'! 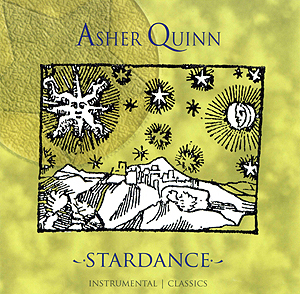 New Age artist Asher Quinn has had much of his catalog of albums re-released in the mid to late 2000's. Among these albums comes Stardance, which is a compilation of instrumental pieces taken from Quinn's albums, Wings Of Fire, Field Of Stars, and Marriage Of the Sun And Moon released in 1990, 1994 and 1995 respectively. So consistent is Asher's body of work, that unless you knew ahead of time it were a compilation, you wouldn't be able to discern it from listening to the album. As is the case with many of Quinn's albums, the instrumentation is done largely by himself, with some added guitar and keyboard work done by his producer at the time, Phil Thornton. For the most part, Quinn plays his parts well; his skills as a pianist/keyboardist are considerable. As a guitarist, Quinn is also adept, though not quite to the level he is at playing the keys. The percussion on the album is very basic; Quinn essentially lays down a track which could easily be a loop due to how unflinchingly similar it remains from start to finish. As a rhythm track, it functions perfectly well but the lack of drum fills is notable, especially on the longer songs. One of the best features of Quinn's work shows itself again on this compilation; a blending of New Age and progressive sounds. Just as easily is Quinn is able to establish a soothing, spiritual mood, he is also able to bring different elements to his songs to vary up the sound. At its most basic, this variation can be as simple as layering on additional instruments to the main melody of the song. In more complex fashion, Quinn can create songs that have different segments to them. The best example of the latter is 'Wings Of Fire'. Quinn begins to song with a brief lyrical segment that transitions into a melody created by a quickly plucked guitar. This segment later gives way to the playing of exotic keyboards and a heavier percussion track. As the arrangement continues to build, Quinn later brings the song back to the guitar and alternates between that and the keyboard to the song's end. At over thirteen minutes in length, there's a lot of music to be had on this song alone, but Quinn's knack for arrangement prevents it from ever growing stale. For another example, the track preceding it, the album's title track, begins with a unique melody that eventually folds into the light percussion, and keyboard backing that typifies Quinn's sound. Still, the guitar work remains engaging from the rhythm to the Spanish guitar that carries sections of the song forward. It's these guitar driven songs that make certain parts of 'Stardance' so remarkably entertaining. 'Hallelujah Sunshine', as described by Quinn in the liner notes, is a "reggae version of Pachebel's Cannon". The reggae sound is more than apparent, but it dominates the sound of the song. Granted, there are still elements of Quinn's sound, but like reggae, the song is based on the premise of repetition. Quinn continues to chant 'Hallelujah' for most of the song's duration and it wears thin on a song that approaches seven minutes in length. 'Circle Dance' is a far better song with repeated vocals, or chanting as it would be. Over the backing chants and drum beat, seemingly inspired by Native American music, Quinn plays around with the sounds of Celtic instrumentation, similar to penny whistles and bagpipes. The track also includes a fantastically played lead guitar that punctuates parts of the melody, breaking it up just enough to let each segment of the song speak for itself. The album loses a bit of steam on its closer, 'House Of Spirits'. The flute melody is a bit morose and uninteresting when compared to the lush instrumentation that backs it up. Compare this to a song like 'Apassionata' where the lead guitar and later, saxophone, are more enjoyable and dynamic in their sound. Either way, the songs present a lot to listen to, but it sounds better when the more compelling instrumentation is up front in the arrangement. Stardance is not the best album in Quinn's catalog, but it does feature some of his best compositions; the title track and 'Wings Of Fire' are amazing songs, well worth the price of admission to this CD. Even though they aren't quite as notable, the opening two tracks, 'On The Way To The Wedding' and 'Pilgrim's Prayer' are also great songs. Parts of Stardance aren't as successful in being as entertaining as the others, though this could be because the high points of the album set the bar too high for others to reach. Regardless, the high points of this compilation from Asher Quinn make Stardance warrant a place in any collection of New Age albums. Dear Asha, thank you for my tape! It is beautiful music. It makes me feel as if I am walking through a forest at night, with stars, and I am happy.